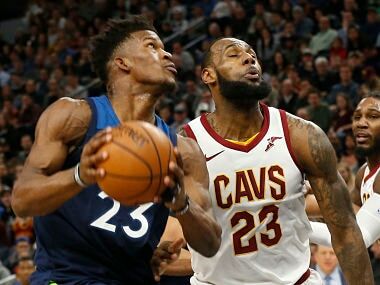 Los Angeles: The Minnesota Timberwolves humbled LeBron James and the Cleveland Cavaliers on Monday, leading by as many as 41 points en route to a 127-99 triumph in Minneapolis. Andrew Wiggins scored 25 points to pace a Timberwolves team that led from start to finish against a Cavs team that went to the last three NBA Finals, winning the title two seasons ago. Karl-Anthony Towns — the only Timberwolves starter to play in the fourth quarter — added 19 points with 12 rebounds and Wolves forward Taj Gibson added another double-double with 16 points and 13 rebounds. Jimmy Butler flirted with a triple-double, amassing 21 points with nine assists and eight rebounds while playing a key role in limiting four-time NBA Most Valuable Player James to 10 points, eight rebounds and five assists. James and the rest of the Cavs starters also sat out the fourth quarter — although for Isaiah Thomas that absence came courtesy of his third-quarter ejection. Thomas was tossed when he reached out toward a driving Wiggins and caught the Minnesota forward under the chin. Assessed a flagrant-2 foul, Thomas was immediately ejected, although he said he was merely reaching in for a steal. "I've gotten numerous steals like that, so it just happened that I hit him in the throat," Thomas said. "I apologized right away because I knew I didn't mean to do that. I'm just glad he's all right." Thomas was playing his third game for the Cavs after a hip injury had sidelined him since he joined the team in a pre-season trade. In his first two games back, the Cavs averaged 129 points a game, but they never fired on Monday. "As a team, we just had no rhythm on both ends," Thomas said. "It's tough when you're getting the shots that you want and they're just not falling — it kind of rubs off on the defensive end." The Cavaliers fell to 26-14. 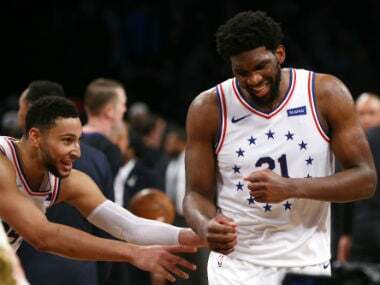 They're third in the Eastern Conference behind Thomas's former team, the Boston Celtics, and the Toronto Raptors — who edged the Nets 114-113 in over-time in a bruising encounter in Brooklyn. DeMar DeRozan's 35 points included a three-point play with 26.1 seconds remaining in overtime that put the Raptors up 114-113. Spencer Dinwiddie, who led the Nets with a career-high 31 points, had a last chance for the hosts but missed a driving layup in the final second. The Raptors lost Kyle Lowry in over-time as the guard went down hard on a frightening fall in which he was sandwiched between two Nets players and landed on a hip. He got to his feet but quickly crumpled to the court again clutching his lower back and was finally carried off by two teammates. He was diagnosed with "an acute back spasm" the Raptors said. Brooklyn saw guard Allen Crabbe depart with an apparent left ankle injury in the fourth quarter. 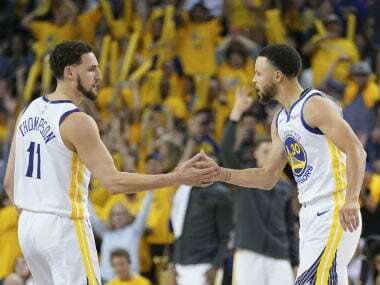 The reigning champion Golden State Warriors shook off an injury scare for superstar Stephen Curry to beat the Denver Nuggets 124-114 in Oakland, California. Curry left the game briefly after a hard fall, but returned with his left knee taped to score 32 points. 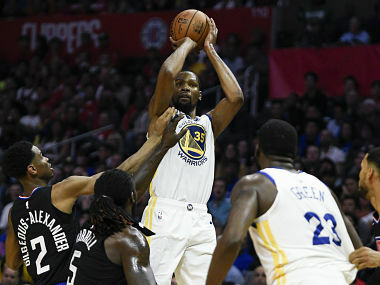 Warriors forward Draymond Green scored 23 points with 10 assists and five rebounds and guard Klay Thompson chipped in 19 points as Golden State again coped admirably with the absence of Kevin Durant, who missed his third straight game with a strained right calf. Denver's Nikola Jokic notched a triple-double of 22 points, 12 rebounds and 11 assists. In Los Angeles, CJ Williams drained the game-winning three-pointer with 9/1 seconds left to lift the Clippers to a 108-107 victory over the Atlanta Hawks. In New Orleans, the Pelicans held on for a 112-109 victory over the Detroit Pistons despite losing star forward Anthony Davis to a sprained right ankle in the third quarter. 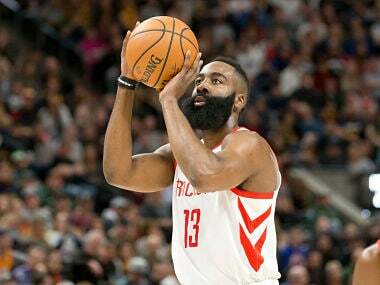 The Houston Rockets, without NBA leading scorer James Harden for a fourth straight game, drained 20 three-pointers in their 116-107 victory over the Bulls in Chicago.